It's been a long three years since Fred Becker's first solo CD release Inner, Stellar. I've been looking for and expecting a new release from him for quite some time. Now we can rejoice. For his second CD release Fred teamed up with Jeff Filbert to record this do-it-yourself collaboration of electronic space music. While on a trip to Florida 2 1/2 years ago to witness a Space Shuttle launch, Fred spent a day visiting and jamming with Jeff. Luckily for us, Jeff recorded the session directly to his cassette recorder. Over the intervening years Fred and Jeff worked with David Wright to extract the best pieces, remove the tape hiss, and master the tracks to a DAT and thus to the CD. David Wright cleaned the sound up so well that you would never have guessed that the original recording method was analog! Phase One is a far cry from Fred's Inner, Stellar. 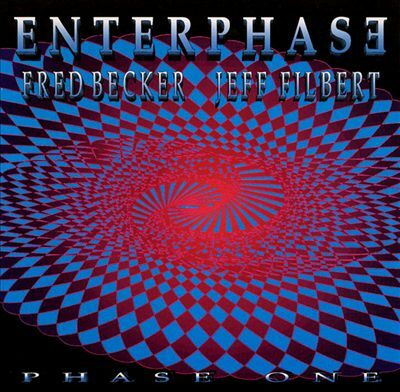 Whereas Fred's first release recalled the ambient and sequenced Teutonic electronics of the seventies, Phase One is definitely nineties space music. Fred is quite a talented musician, his improvised work always sounds as if he scored it. I know from recording with Fred several years ago, his approach is to program a sequence, let it run, and then improvise over the top. The same is true with Phase One and Jeff is clearly able to musically complement Fred's thoughts. There are only five tracks on this CD, the longest, "Time Dilation," being 27 minutes. The other four clock in at 10 minutes or less which is the proper length for this music. "Time Dilation" wears thin chiefly because the simple eight note sequence dominates the music for almost the entire piece. I therefore found it difficult to pay attention to what Fred and Jeff were playing. Overall Phase One is an amazing musical record of two musicians that had never played together before. There is something magical in their improvised cosmic music. It is very relaxing. I much prefer their ambient efforts "Altarian Meadow" and "Andromeda Signal" to the heavily sequenced "Lunar Vista," "Blue Shift," and the above mentioned "Time Dilation." Since Phase One is an improvised album it is not derivative of any particular electronic style. It stands on its own merits while at the me time you can hear the influences of Tangerine Dream, Klaus Schulze, Vangelis, and Cluster. If you are looking for a refreshing change of space you owe it to yourself to listen to Phase One. It certainly transcends the orchestrated efforts of a lot of contemporary space music artists.